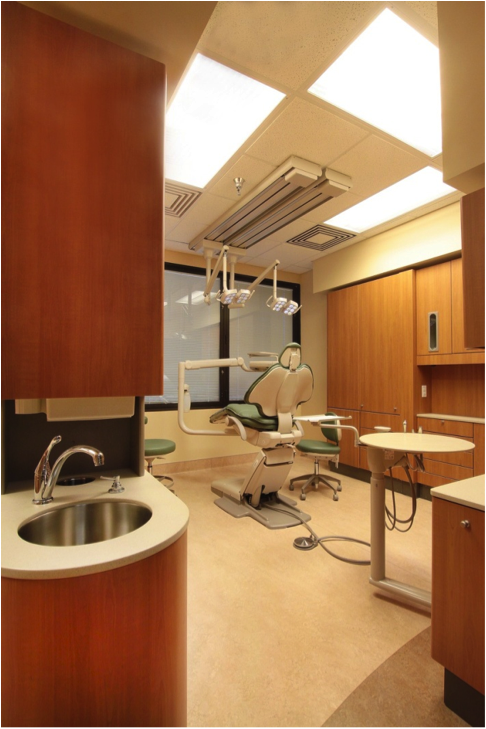 This project at the VA Medical Center involved the build-out of 30,000 SF of new space into dental, eye, and neurology clinics. The interior design features provide for a comfortable healing environment while creating over 160 separate spaces, each with temperature control and communications. Construction included a new HVAC system with DDCs, new electrical and plumbing, fire sprinklers, interior finishes, wall guards and crash rails, medical gas system, and final connections to the Owner-furnished laboratory casework. CCTV cameras were also installed and connected directly to the security police. Their conductors were run in conduit rather than as plenum cable to prevent tampering. Construction was performed in an active hospital, requiring strict attention to infection control, dust control, and life safety measures, as well as necessitating extensive Owner coordination to minimize disruptions to hospital operations. Kevcon’s focus on detailing, space, and system optimization produced a well-received project that was comfortable, aesthetically appealing, and economically efficient.